In 1923, a young assistant professor of New Testament at Princeton Theological Seminary named J. Gresham Machen published a scathing critique of the worldview animating establishment or “mainline” Protestant Christianity in Europe and America. That worldview, Machen argued in Christianity and Liberalism, consisted in a groveling obeisance to anything claiming to be based on “science.” So for instance if “science”—or the habit of mind claiming to be “scientific” that amounted to little more than doctrinaire materialism—insisted that a virgin could not conceive of a child and therefore the Christian doctrine of the virgin birth must be based on a myth, a certain class of Protestant clergy and intellectuals would dutifully drop the doctrine. If “science” denied the possibility of the Resurrection, those same Protestants would figure out a way to jettison the doctrine but keep calling themselves Christians. “The liberal attempt at reconciling Christianity with modern science,” Machen wrote—he disliked the term “liberalism” to describe the obsequious attitude he inveighed against, but there was no convenient alternative—“has really relinquished everything distinctive of Christianity, so that what remains is in essentials only that same indefinite type of religious aspiration which was in the world before Christianity came upon the scene.” His aim in writing the book was not to show that Christianity shed of the supernatural was a bad thing, though he thought it was. His aim, rather, was to show that it was a form of mere uplift and not Christianity at all. To the extent that Christianity adopted “liberal” positions on its distinctive doctrines, Machen felt, it relinquished any claim to authority or purpose. Western nations had no shortage of institutions trying breathlessly to align themselves with dominant cultural trends. There was no need for another. The publication of Christianity and Liberalism occasioned an uproar in the large Protestant denominations of the Northeast and Midwest and marked an early fray in the ongoing conflict between conservative and liberal, or orthodox and progressive, interpreters of the Christian religion—a conflict in which neither side has always acquitted itself with honor and charity but one in which the disputed principles were, and remain, important. Whatever else may be said about this long struggle and its many ugly controversies, Machen’s argument has largely been vindicated: His hermeneutical assumptions have been derided as regressive and naive by the most esteemed scholars of Europe and North America for a nearly a century, but liberal Protestant denominations find themselves in more or less the situation he foresaw: dwindling in numbers, without influence, bereft even of the respectability they believed they had purchased. 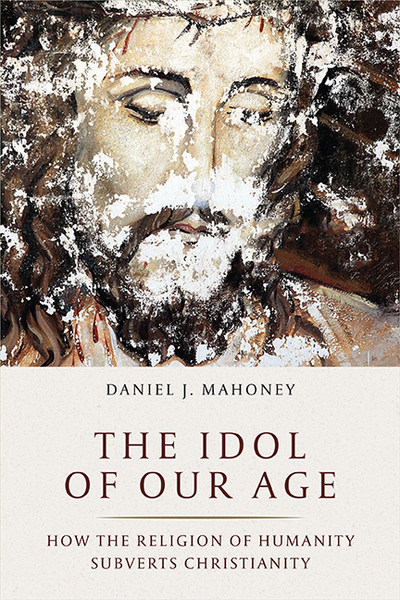 I thought repeatedly of Machen’s insurrectionist little book as I read Daniel J. Mahoney’s The Idol of Our Age: How the Religion of Humanity Subverts Christianity. Mahoney is a Roman Catholic and accordingly his book is concerned with institutional corruption rather than the integrity of doctrinal belief, but his aim is strikingly akin to Machen’s: He is less interested in arguing that the social progressivism embraced by the Catholic Church’s enlightened elite is in itself a bad thing than in insisting that it’s something altogether other than Christianity. That may sound like a merely stupid failing—an obsession, say, with injustices done to illegal immigrants thousands of miles away but hatred for one’s neighbor who takes a different view—but Mahoney contends that religious humanitarianism is much worse than that. As the citizen’s love and loyalty attach less and less to those nearest to him and more and more to an abstract and idealized agglomeration of “humanity,” social bonds loosen and politics itself becomes meaningless. Political activity can only take place within defined groupings of people; there can be no negotiation or arbitration among members of an otherwise undefined humanity. This is of course not a new concern; the principle of subsidiarity, the belief that social or other problems are best handled by the people nearest to them and not by faraway authorities, is an old one in Catholic social teaching and has a central place in Anglo-American conservatism. Mahoney draws on the works of the the contemporary French philosopher Pierre Manent, the Hungarian philosopher Aurel Kolnai, the Russian theologian and literary critic Vladimir Soloviev, the American journalist Orestes Brownson, and the great Russian writer Alexandr Solzhenitsyn to elucidate the ways in which Catholic laymen, intellectuals, and authorities—very much including Pope Francis—are allowing a desiccated humanitarianism to take the place of the Christian gospel itself. They are, as Machen complained about liberal Protestants a century ago, dutifully taking their orders from sages and experts who have only contempt for Christianity and so relinquishing the very thing they mean to preserve: their own relevance. Father Severyan takes this view both because war is necessary to the human condition and because without it there is no possibility of checking an aggressor. Tolstoy’s embrace of humanity in the abstract led him and his many admirers to formulate a philosophy that leaves innocent people of flesh and blood without defense. I recall a speech on the floor of the U.S. Senate by Barbara Boxer in 1990 in which the California senator urged against using military force to push Iraqi dictator Saddam Hussein out of Kuwait. Boxer read lines from the song “From a Distance,” made popular that year by Bette Middler. “From a distance,” Boxer intoned, “you look like my friend / Even though we are at war / From a distance / I just cannot comprehend / What all this fighting’s for.” It was a preposterous and shameful oration, but it must have made perfect sense to Boxer and her allies: War can never be just because, considered in the abstract—“from a distance”—our enemies look just like ourselves. In a sense, the religion of humanity sees everything from a remote distance. How blessed are we that—at least according to the Christian gospel—God doesn’t regard us with the same aloof, theoretical concern.